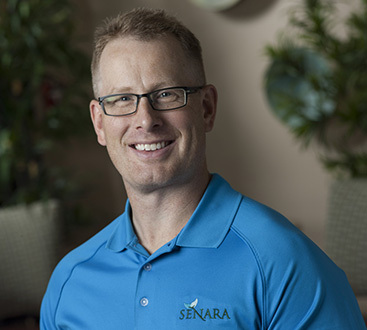 Senara Men’s Health Center is a division of Senara Health and Healing Center & Spa in Peoria, IL. As a natural extension from our anti-aging services, the Men’s Health Center came about as a passion project for Dr. Kramer. Discovering a gap in the Central Illinois medical community, Dr. Kramer made it his mission to provide a place where men could find solutions tailored to their unique needs. Of particular interest, improving sexual health and vitality without pills or surgery. Thus, Senara Men’s Health Center began. Our approach to men’s healthcare is simple. We want you to feel – and look- as virile and energetic as you did when you were younger. Whether that is in the bedroom or the boardroom, we offer solutions to help you achieve optimal living. Have questions? We’re here to help. Connect with our front desk to schedule an appointment, inquire about treatment options, or be connected with one of our nurses for post procedure questions. Click on the map for directions to Senara. *Please note, the hours listed are for our full facility, which includes our day spa. Health Center treatment hours differ slightly. Send us an email, any time of day! We respond to appointment requests within 24 business hours. For same day appointment requests or immediate needs, please call us directly at 309.693.9600.